The year 1979 was a pivotal year for the 10th place Blue Stars, as it would be the last season until 2008 that the corps would be seen in the DCI World Class World Championship Finals. For the next 28 years, the corps went through a number of competitive and membership challenges and for most of those years competed in what was then called Division II & III, winning a few divisional championships along the way. For the four years from 1976 through 1979, Blue Stars was the only corps other than Santa Clara Vanguard that had made it into the Finals in all of the first eight DCI World Championships. 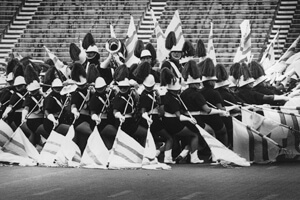 (In DCI's inaugural season of 1972, the corps placed 2nd.) The corps' 1979 show started with "St. Louis Blues," the popular blues march written by W.C. Handy and later popularized by Duke Ellington. As with many corps during that era, the show started with a drum intro, climaxing with a company front halfway through. Visually, a unique feature to the corps' uniform was the strands of tinsel that hung off the right side of the cummerbunds of the horn line members, creating a sparkling accent that was removed at one point and used for flashy hand gestures. (The same type of tinsel also hung from both ends of the flagpoles.) However, for many, the most unique feature of the corps' uniforms was the hot pants worn for the prior few seasons by the color guard. Hot pants were popular during the entire 1970s, roughly paralleling the men's polyester leisure suit craze that contributed to many toxic landfills once the rationalization of the Reagan 1980s brought a merciful death to the disco era. The second piece in the show was "Birdland" by Josef Zawinul, the Austrian immigrant who had toured with Maynard Ferguson, Cannonball Adderly, Miles Davis and co-founded Weather Report. The piece was written for and recorded by Weather Report just two years earlier, and as such, the work was not yet all that familiar to drum corps fans, as Blue Stars were one of the first corps to perform the work. An extended drum break featured 12 umbrellas popping up from within a line of flags that separated in a "V" formation, bringing back the unique prop that was introduced during the corps' "Backwoods Sideman" concert standstill feature in 1977. For a concert standstill in 1979, the corps utilized Chick Corea's "La Fiesta," with some good old-fashioned soprano screaming. 1979 Blue Stars performance excerpt. A highlight of George Gershwin's "Strike Up the Band" was when the guard did a flag exchange from a sitting position. And speaking of sitting positions, note in the accompanying video clip how the color guard members formed a tight ring around the brass soloist and sat on each others' legs as the flags gently swayed around the circle of variable flag heights. All it would have taken was for one member to lose balance and the entire guard would potentially have collapsed to the ground. The final selection was Chuck Mangione's "Children of Sanchez," from the 1979 movie with Anthony Quinn of the same name. Mangione won a Grammy for the film score and a Best Pop Instrumental Performance Grammy for the title song. Eight DCI corps performed this piece in their shows in 1979. Three of those corps, Blue Stars, North Star and Cavaliers, all made it into the Finals that year. It's safe to say that fans could not complain about not getting enough "Children of Sanchez" in their musical diets that year. Entering the Finals in eighth place, Blue Stars ultimately dropped to 10th in the final standings and weren't seen back again in the big show until 2008. To appreciate the evolution of the drum corps activity over that lengthy time span, check out the video from the July 11 Download of the Week, featuring the 2008 Blue Stars. This week only, you can save on 1979 World Championship Audio and Video Performance Downloads on the DCI Fan Network. Buy the 1979 Blue Stars Video Performance Download. (Available this week only for $3.99. Regular price: $4.99.) Buy the Audio Performance Download bundle of all 12 Finalists from 1979. (Available this week only for $15.99. Regular price: $19.99.) Offer ends Monday, Jan. 23 at 8:30 a.m. ET.